If you look at my thumb in the photo, you can see the egg squishing in. Is this where rubber ducks come from? 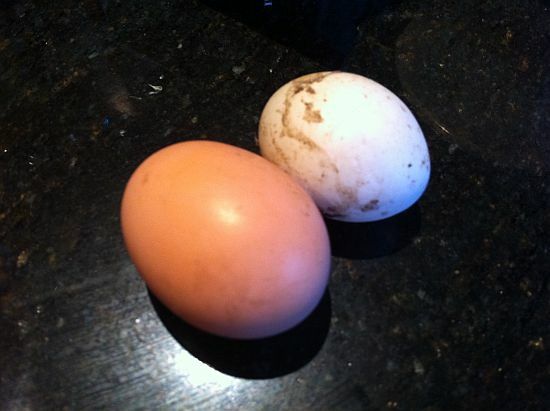 Another blogger I follow, Christi, had a rubbery chicken egg not along ago. Check out her blog by the way, it’s awesome! Her stories of the goings-on around their farmlet are always entertaining, and I love the stick figure drawings used to illustrate them. Rubbery eggs can be caused by low calcium (probably not our problem), stress (maybe – we’ve had a fox around, and thunder storms recently), or just weirdness (definitely plenty of that around our place!). That’s a normal chicken egg in front of it, just for scale. I guess I’ll keep this one for next time I’m halving a recipe that requires three eggs. Have you had any weird eggs lately? 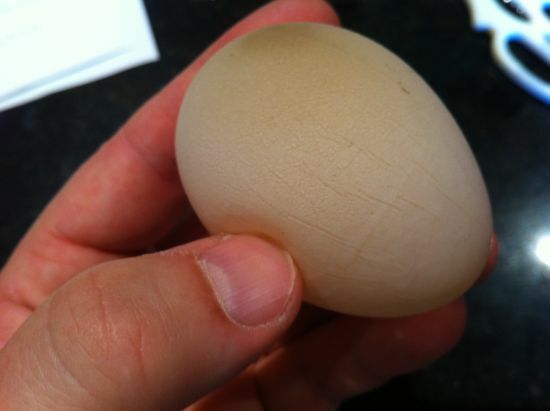 @Deb: I’ve heard of another guy that has a chicken laying a rubbery egg every week or so. I guess occasionally a bird goes weird like that. He just hard-boils them and eats them. Wow I have never soon this, interesting.